This recipe is so yummy that even my 2 year old loves it. Gotta have something to do with the vodka . It’s an oldie, but a goodie! Approximately 1 cup of chopped or shredded basil, more if you like it! Lightly brown the Italian sausage in a non stick pan for 5-7 minutes. Just enough to firm them up and make them easier to cut. They do not have to be completely cooked at this point. Pull sausages out of the pan and slice into 1/2 inch pieces. Throw them back into pan and fry until browned and cooked thoroughly, about another 7-10 minutes. Place sausage pieces into a bowl and set aside. Clean your current pan or be lazy like me and get out another pan. Pour in olive oil and butter, then heat over medium high heat until butter is frothy but not browned. Quickly stir in onion and shallots, cook for 2-3 minutes then add in mushrooms. Saute for an additional 5 minutes. Don’t forget to check to see if your pasta is done!!!! Add vodka to the mushroom mix and cook until the liquid reduces by half. Next pour in chicken stock, tomatoes(including juice from cans), and garlic, then lower heat. Add sausage pieces back to pan. Simmer for 10-15 minutes until flavors of your sauce are combined. Whisk corn starch into cream until blended. Mix cream mixture with sauce and simmer until thickened, about 3 minutes. Remove pan from heat and stir in pasta and 1/2 cup of the basil. Sprinkle parmesan and remaining basil on top. 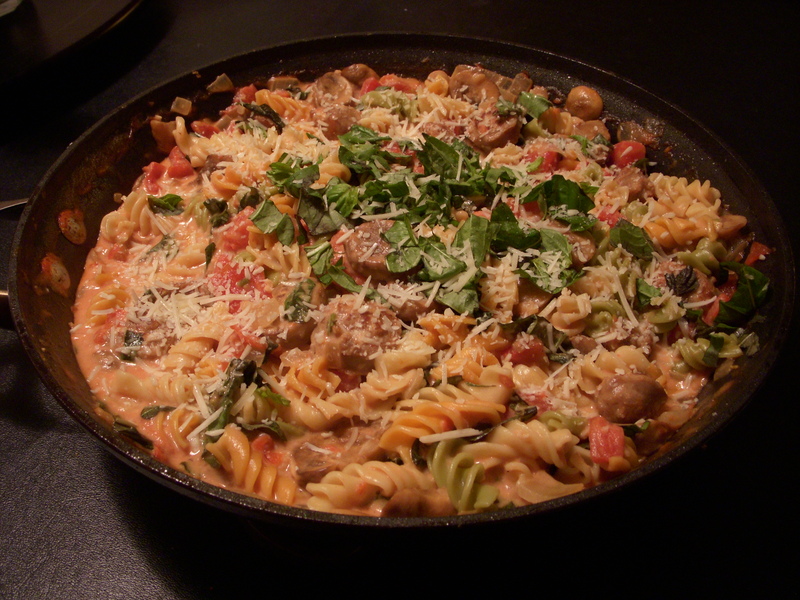 I love serving this with french bread and a salad… total pasta basics! For a vegetarian version: Omit sausage, and chicken stock. Substitute veggie stock , add 1/2 tsp fennel seeds and 1/4 tsp red pepper flakes when putting in the tomatoes and garlic. I think fresh sliced fennel bulb might be a good addition to saute with the mushrooms and onion if you like as well. MMMMmmmmmMMMMMmmmm!